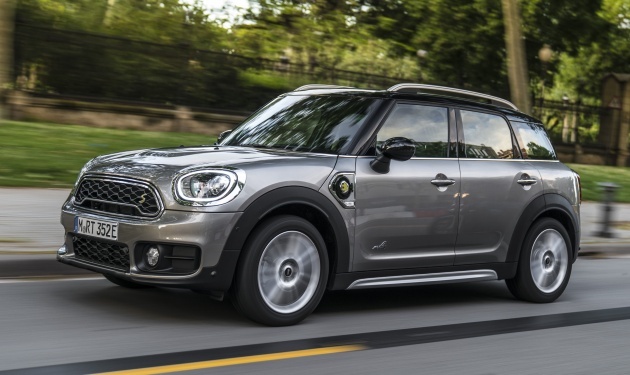 MINI Malaysia looks set to expand its Countryman line-up in the country with the new MINI Cooper S E Countryman All4, the brand’s first plug-in hybrid model. Those who are interested will be glad to know they can now register their interest at a dedicated page on the company’s website. First revealed in October last year, the plug-in hybrid Countryman uses the same powertrain as the BMW 225xe Active Tourer. The setup consists of a 1.5 litre turbocharged three-cylinder petrol engine (134 hp and 220 Nm), six-speed Steptronic automatic transmission, rear-mounted electric motor (87 hp and 165 Nm) with two-stage single-speed transmission, and a 7.6 kWh battery. In total, the system has an output of 221 hp and 385 Nm of torque, which is enough to get the SUV from a rest to 100 km/h in just 6.8 seconds. Following European Union test cycle, the plug-in hybrid Countryman has a fuel consumption of as low as 2.1 l/100 km. The model also features various modes for the powertrain, including Auto eDrive, Max eDrive and Save Battery. The first allows the model to run on electric power only up to a speed of 80 km/h, and the engine is called upon for more intensive loads. In Max eDrive, the vehicle runs on electric power alone at speeds of up to 125 km/h until the battery runs out of juice. Lastly, Save Battery lets drivers raise the battery’s charge state to at least 90% for use later on. The new Cooper S E Countryman All4, when it is launched, will join existing, petrol-only models such as the Cooper Countryman, Cooper S Countryman and the more recent John Cooper Works Countryman. Pricing for the plug-in hybrid model hasn’t been revealed yet – the current Countryman offerings range between RM239,888 and RM348,888. You can click here to register your interest. Thats for the JCW model – top of the line performance variant. Richard van Winkle must have went to tido in 1950s and just woke up now to find the British Mini now is a BMW in disguise with the same price to boot. Kesian kesian. Gonna bet it will be priced in between especially if it’s a CKD model. The 530e was a bad start for BMW Malaysia after successfully launching the X5e and 330e with correct pricing. I heard from a MB sales person that the 740e X5 and 330e was subjected to full tax exemption as it was launched much earlier. If you look at the XC60, E Class, C Class today, all didn’t get full tax exemption. Government no money liao. New NAP went into effect at that time. Now if hybrid/EV CKD here can get tax exemptions. Do keep up to date. John, go check and compare why all the new Volvos PHEV (XC60) and MB PHEV (E Class and C Class) are all the most expensive variant in the line up. While BMW managed to launch all their PHEV (X5 and 330e) models 2 years ago with the full tax exemption. BMW now can’t price their 530e the same level as before, thats why they have to de-spec the car to sell below the 530i. the price needs to be revised. so much money for such a small car? A person is 5ft tall and have 20k in bank. Another person 5ft tall too but have 10million in bank. Will you say so much money for such a small person? Think again. If everything is about size then earth is so much smaller than jupiter that it shouldnt even exist. A table spoon portion of a neuron star is heavier than an attire earth. Our logic is confined in our little brain. Think harder outside of box and u ll be able to afford it and smile at those beside u that act the same way as the previous u and tell them to try harder or buy a bus instead. for the same price, most people would rather get a bmw 330e or merc c350e.